Episode #220: Superman Comic Books Cover Dated August 1960: Superman #139 & Action Comics #267! Superman #139 & Action Comics #267! SUPERMAN 139, August 1960, was published around June 16, 1960. It contained 32 pages for the cover price of a dime. The editor was Mort Weisinger, and the cover was pencilled by Curt Swan and inked by George Klein. All three stories in this issue were reprinted in SHOWCASE PRESENTS: SUPERMAN vol. II. - THE NEW LIFE OF SUPER-MERMAN (9 pgs. ), written by Jerry Siegel, pencilled by Wayne Boring and inked by Stan Kaye.This story was Jerry Siegel's 17th silver age Superman story, and the 34th overall in this era. - THE JOLLY JAILHOUSE (8 pgs. ), written by Jerry Coleman and drawn by Al Plastino. - THE UNTOLD STORY OF RED KRYPTONITE (9 pgs. ), written by Otto Binder, pencilled by Curt Swan and inked by John Forte. This story was also reprinted in SUPERMAN FROM THE THIRTIES TO THE SEVENTIES and SHOWCASE PRESENTS: SUPERGIRL vol. I. ACTION COMICS 267, August 1960, was published on June 30, 1960. It contained 32 pages of the cover price of 10¢. Mort Weisinger was the editor, and the cover was pencilled by Curt Swan and inked by Stan Kaye. - HERCULES IN THE 20TH CENTURY was the 13 page Superman story, written by Otto Binder, pencilled by Wayne Boring and inked by Stan Kaye. This story was reprinted in SHOWCASE PRESENTS: SUPERMAN vol. II. - THE THREE SUPER-HEROES was the 13 page Supergirl story, written by Jerry Siegel and drawn by Jim Mooney. It was reprinted in LEGION OF SUPER-HEROES ARCHIVE vol. I, SUPERGIRL ARCHIVES vol. I, SHOWCASE PRESENTS: LEGION OF SUPER-HEROES vol. I and SHOWCASE PRESENTS: SUPERGIRL vol. I. This was Jerry Siegel's 36th silver age story overall. His 35th story was MR. & MRS. CLARK (SUPERMAN) KENT in SUPERMAN'S GIRL FRIEND LOIS LANE 19, August 1960, drawn by Kurt Schaffenberger. 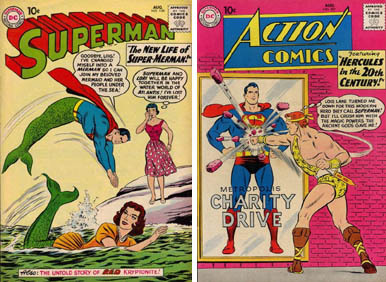 Elsewhere in DC Comics, 32 titles carried the August or August/September 1960 cover date. Next Episode: SUPERMAN FAMILY COMIC BOOKS COVER DATED JULY/AUGUST 1957: SHOWCASE 9 (featuring SUPERMAN'S GIRLFRIEND LOIS LANE) and WORLD'S FINEST COMICS 89! In two weeks: SUPERMAN ANNUAL 1! Episode #219: Superman Family Comic Book Cover Dated June 1957: Superman's Pal Jimmy Olsen #21! Superman's Pal Jimmy Olsen #21! SUPERMAN'S PAL JIMMY OLSEN 21, June 1957, was published around April 16, 1957. It contained 32 pages for the cover price of a dime. Mort Weisinger was the editor, and the cover was pencilled by Curt Swan and inked by Ray Burnley, who were the art team for all three 8 page stories, written by Otto Binder. All three stories were reprinted in SHOWCASE PRESENTS: SUPERMAN FAMILY vol. I. Elsewhere in DC Comics, 32 titles carried the June or June/July 1957 cover date. Next Episode: SUPERMAN COMIC BOOKS COVER DATED AUGUST 1960: SUPERMAN 139 & ACTION COMICS 267! In 2 Weeks: SUPERMAN FAMILY COMIC BOOKS COVER DATED JULY/AUGUST 1957: SHOWCASE 9 & WORLD'S FINEST COMICS 89! Episode #218 Part IX: MegaCon 2012 Wrap Up! 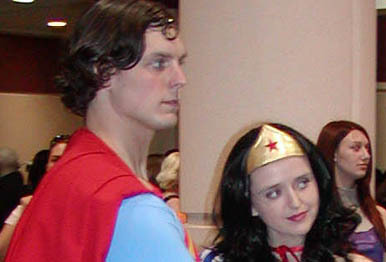 Superman and Wonder Woman at MegaCon 2012! Download Episode #218 Part IX! I wrap up my coverage of MegaCon with this episode, sharing my thoughts about the panels, some of the comic book pros I met, and some of the comic books I bought at the convention. MegaCon 2013 will occur from March 15 - 17, 2013. Mark Mekkes' website is entireprizeenterprises.com, where you can find his online comics, as well as his e-book, ACTING FOR COMICS. Glenda Finkelstein's website is http://www.glendas-books.com. Phil McCall's work can be found at http://www.plmii.com. For more information about Comfort Love and Adam Withers, go to their blog. Search for Comfort and Adam individually at ComicArtFans. Comfort and Adam also have art posted at deviantART. Print and digital editions of their comic book series THE UNIQUES and RAINBOW IN THE DARKcan be ordered directly from them. 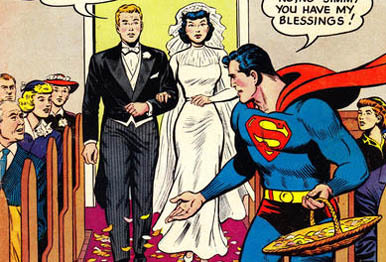 Next Episode: SUPERMAN FAMILY COMIC BOOK COVER DATED JUNE 1957: SUPERMAN'S PAL JIMMY OLSEN 21! In 2 Weeks: SUPERMAN COMIC BOOKS COVER DATED AUGUST 1960: SUPERMAN 139 & ACTION COMICS 267!